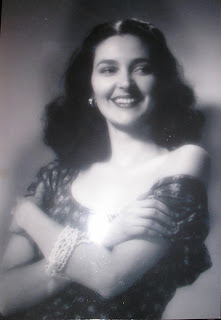 Stella Greka become her career as a movie star with the film “Broken hearts (1945)” of Orestis Laskos, and she kept the leading role of Louiza Hrysani (Ragismenes Kardies). Her natural beauty was incredible similar to the great Hollywood stars like Ava Gardner and Rita Hayworth. The next movie for Stella was “Forgotten people (1946)” in Greek (Prosopa lismonimena) of George Tzavellas. The last movie for Stella Greka was the drama Marina (1947) of Alekos Sakellarios. 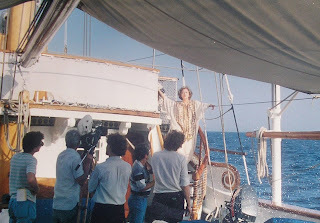 In all her movies Stella Greka sung beautiful songs and she become at the some time the leading singer for Greece. The National Radio of Greece engaged her for live radio performances of all new songs. And all the songs that Stella sung at that time become the all time classic Greek songs. (Last night I had a dream), (When I See You), (I'm Leaving), (For You Only), (You brought me the Spring), (Two Green Eyes), (Without You), (You Are Always In My Heart)are some of the songs all Greeks knows by heart and sings all this years and they will continuous to sing. The voice of Stella Greka was dark and beautiful with melodic colors like the Italian bel canto voices. She had an extraordinary three octaves (I hear her singing the aria from Traviata of Verdi), but her specialty was the contralto range. This part of her voice was a mixture of Zarah Leander, Edith Piaf and Patsy Cline all together. The voice of Greka was phenomenal, and Greece didn’t get another voice like hers. Stella Greka left Greece and leaved in America with her husband Mr. Avgerinos a Greek immigrant from Kefalonia and her two sons. Stella Greka now lives in her native city Athens, Greece. Αναρτήθηκε από KAROUSOS ART CRITICS στις 11:10 π.μ.